Whether you drive your cars thousands of miles a year, or leave it parked for many seasons, hydraulic shocks and struts will inevitably be in need of replacing at some point in the vehicle's life. FCP Euro offers a very wide variety of suspension parts for P1 Volvos. You might be surprised just how many different factory options exist for the C30, S40, V50, and C70, not to mention the few aftermarket options as well. If you are uncertain of which suspension options fit your car, or which exact item your car came equipped with from the factory, please refer to the vehicle's product plate. Necessary tools to jack up / support a car and remove the wheels. With the rear wheel removed and the vehicle securely resting on jack stands, you will have easy access to the three bolts which hold the rear shock in place. At the top of the wheel well, you can easily locate the two upper shock mount bolts. Slightly loosen these, but do not remove the bolts entirely. On the opposite end of the shock, you will see one larger bolt which holds the shock to the trailing arm. This will be easiest to access and remove from underneath the car. It is important to note that on AWD models, this bolt will sit perpendicular with the rear axle. The image below depicts a FWD model. With the lower bolt removed, return to the top of the shock and completely remove the two previously loosened bolts. If you are replacing the entire shock assembly, the new shock may come completely assembled with the bump stop and mount. However, if you are only replacing a certain part of the shock, or if you need to reuse any of these items, you will need to remove the single nut at the top of the shock assembly in order to slide off the various components. New shocks can completely transform how a car rides and performs. If you opt for sportier aftermarket shocks, or even a set with adjustable dampening, it may take a few drives to relearn the car's new handling characteristics and find the level of dampening which best suits your preferences. 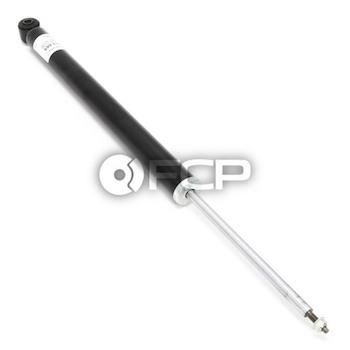 However, it is very important that you only run shocks specifically design for your vehicle. While you can swap between the different shocks for comfort, sport, etc. do not attempt to install rear shocks from a different platform vehicle, even if they are the same length. Dampening and valving is set specifically for the characteristics of your particular model; running a different shocks may greatly affect the handling characteristics, sacrificing both comfort and safety.